Articles from „Port Phillip Herald” printed in 1840. 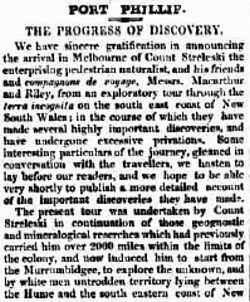 We have sincere gratification in announcing the arrival in Melbourne of Count Streleski the enterprising pedestrian naturalist, and his friends and companions de voyage, Messrs McArthur and Riley, from an exploratory tour through the terra incognita on the south-east coast of New South Wales; in the course of which they have made several highly important discoveries, and have undergone excessive privations. Some interesting particulars of the journey, gleaned in conversation with the travelers, we hasten to lay before our readers, and we hope to be able very shortly to publish a more detailed account of the important discoveries they have made. The present tour was undertaken by Count Streleski [sic!] in continuation of those geognostic and mineralogical researches which had previously carried him over 2.000 miles within the limits of the colony, and now induced him to start from the Murrumbidgee, to explore the unknown, and by white men untraded territory lying between the Hume and the south eastern coast of New South Wales. At Ellerslie, a station belonging to H. H. McArthur, Esq., MC, the Count was joined by Mr. James McArthur, and Mr. Riley, both of whom were eager to share with the Count in the toils and gratifications of such an undertaking. The party seems to have started well provided with provisions and pack horses, and all well mounted excepting the Count, who having with him a considerable number of valuable instruments necessary for the prosecution of his observations, which on account of their delicate construction required the greatest care of carriage, preferred pursuing his journey on foot with his budget on his back. From Ellerslie the pray descended into the beautiful valley of the Hume, or Murray, and followed its picturesque windings for about fifty miles. Here the travelers encamped; the Count and Mr. McArthur ascended the Australian Alps, and on the 12th of February, about noon, they found themselves sitting on the most elevated peak of Australia, at the height of 7.800 feet above the level of the sea, beyond the reach of vegetation, surrounded by perpetual snows, with a serene and lucid sky above them, and below, an unbroken view over an extent of about 4.000 square miles. On the summit of the Alps Count Streleski secured many valuable meteorological and magnetic observations, — the trigonometrical survey, which the Count had begun and carried on from the Murrumbidgee, received new supports from this predominant point; valuable materials for future publication were also obtained in aid of the Count’s barometrical survey and his geognostic and mineralogical investigations. From the Snowy Range, retracing their steps for about thirty miles to the westward, the party struck for the south, through a broken and uninhabited country opening as it were by their first track, perhaps a future communication with the Murray. Arrived at Omeo, the country afforded new and ample harvest of observation and gratification, from its peculiar geognostic character and connecting links of the survey. In three days’ journey from Omeo, in a south-east direction, the party crossed the dividing range, and in four days more found themselves in a new and splendid country clothed with the richest pasture, and intersected with numerous rivers — an immense inland lake and its ramified lagoons; in fact, opening up in every direction fresh fields for the operations of the settler, such as no other part of the colony which had come under the notice of the travelers presented. The country from latitude 37 deg. 10 mm S., assumed the most cheering and gratifying aspect, but the rivers which bisect the country from NW to SE greatly retarded the progress of the travelers, whose provisions now began to fail. On the sixth of April, it was determined to place all hands on half rations (a biscuit and a slice of bacon per day), but new difficulties and new delays soon rendered it evident that even with this precautionary measure, it would be impossible to make the stock of provisions last out the journey. The greatest impediment the travelers had to contend with was the exhausted state of their horses; each day saw one or other of the party dismounted, to follow the Count on foot — but this, far from removing, only increased the impediments to their progress, for the men unaccustomed to walk, like the horses, began to feel the effects of the wear and tear of the journey. In this situation it became necessary for the travelers to relinquish (which they did with regret) their original intention of prosecuting their researches as far as Wilson’s Promontory, and thence commencing the exploration of the sea-coast, its inlets and outlets, and to take instead the straight course for Western Port, the nearest point whence fresh supplies could be obtained. The open forests, plains, and valleys, through which the party, if well supplied with provisions, might have traveled at leisure, had now to be exchanged for a rocky and mountainous path, through which a passage could not be effected without infinite difficulty. The horses, now completely exhausted, served more to retard than to accelerate the progress of the travelers, and they were finally obliged to abandon them in a valley of tolerable pasture and well watered, about seventy-five miles beyond Western Port; here also they were forced to leave the packs with the men’s wearing apparel, and the Count’s mineralogical and botanical collection, taking with them only their blankets and the residue of their bread, which, notwithstanding the allowance had been greatly restricted, did not last longer than four days from this time. From this place, the Count and his companions took, and at all hazards maintained a direct course to Western Port, in the hope of bringing their sufferings to a close as speedily as possible; but unfortunately this course led them for days together through a dense scrub, which it was almost impossible to penetrate. The party was now in a most deplorable condition. Messrs McArthur and Riley and their attendants had become so exhausted as to be unable to cope with the difficulties which beset their progress. The Count being more inured to the fatigue and privations attendant upon a pedestrian journey through the wilds of our inhospitable interior, alone retained possession of his strength, and although burdened with a load of instruments and papers of forty-five pounds weight, continued to pioneer his exhausted companions day after day through an almost impervious tea-tree scrub, closely interwoven with climbing grasses, vines, willows, fern and reeds. Here the Count was to be seen breaking a passage with his hands and knees through the centre of the scrub, there throwing himself at full length among the dense Underwood, and thus opening by the weight of his body a pathway for his companions in distress. Thus the party inch by inch forced their way, the incessant rains preventing them from taking rest by night or day. Their provisions during the last nineteen days of their journey consisted only of a very scanty supply of the flesh of the native bear or monkey, but for which, the only game the country afforded, the travelers must have perished from utter starvation. This food, which the travelers describe as somewhat of the toughest, was but scantily obtained, and the nutriment it afforded, was altogether insufficient for the maintenance of the health and strength necessary for undergoing such fatigue. On the twenty-second day after they had abandoned their horses the travelers came in sight of Western Port, and the sensations which were created by the first view of the water on which a small vessel was riding at anchor, and the blue smoke curling among the trees, may be more easily imagined than described. It was upon Mr. Berry’s tent the party had stumbled, and to his hospitality and kind attention to their wants they owe their recovery to health and vigour. Messrs McArthur and Riley, acknowledge themselves to be under great obligations to Count Streleski, to whom under Divine Providence, they attribute their safety. Although furnished with sextant and artificial horizon, the state of the weather was such that during the last twenty-two days, notwithstanding the utmost exertion of the travelers, the latitude and azimuth could only twice be ascertained, but such attention was paid to the variations of the compass, and laying down the course upon the chart that the latest observation did not differ from the meridian of Western Port more than two miles. In the course of a few days the public may expect a more circumstantial narration of the journey, and an opportunity will be afforded for the inspection of the chart of the new and valuable country which the Count, in honour of His Excellency the Governor, has designated Gipps’Land. We have much pleasure in stating, that in the opinion of Count Streleski there exists no impediment to the immediate occupation of Gipps’Land, by the enterprising set- tiers of Port Phillip, and that it is much more easy access from Melbourne than from Maneroo, or the Omeo country. The brilliant prospects which the discovery of so splendid a country in the (hitherto considered barren) region lying between Australia Felix and the outer coast stations of New South Wales, opens up to this province must be obvious in all, and we trust Count Streleski and his gallant companions will not be allowed to leave Melbourne, without some public testimonial of the approbation of the colonists. Count Streleski [sic!] and his party were accompanied on the late adventurous expedition through the newly discovered territory called Gipps’Land, by a black named Chancy belonging to the Golbourne [sic!] Plains tribe, who for the last three years has attached himself to Mr. James McArthur, son of the Member of Council. When the provisions of the party became completely exhausted the whole party must have perished from starvation but for the exertions of Chancy, who catered for the larder a sufficiency of wombat, or native bear, to afford them a precarious sustenance. On one occasion when reduced to great straits and worn out with fatigue, his master and all but the Count had almost given up the toilsome struggle in despair, Chancy, though not less exhausted than his friends, endeavored to cheer their drooping spirits, and seating himself on a log beside Mr. McArthur, he said, looking affectionately in his face, „me never leave you massa”. The fervor with which the unsophisticated son of nature expressed his determination to share the fate of his young master touched the hearts of his companions in distress, and encouraged them to persevere in their efforts to overcome the obstacles which lay between them and safety. We love to record such good deeds as these when performed by our sable brethren; who can say after perusing this interesting anecdote, that gratitude dwells not in the breast of the savage? We beg to call the attention of our readers to the narrative, published below, of Count Streleski’s exploring in Gipps’land. It is already well known that he was accompanied by his friends Mr. James McArthur, of the Vineyard, Parramatta, and Mr. Riley, the party being completed by two white servants and a black fellow. We have also before noticed the great suffering and privations which were endured by all alike. It will be unnecessary for us to point out the very signal services which Count Streleski has rendered to New South Wales in general, and more particularly to this province, in the discovery of Gipps’land. Nor do we confine ourselves to this alone; for the services of a man who, for years and years, pursues scientific research through danger, and toil, and privation, are not services to this age alone, or to this country, but benefits to posterity, and to the world. Where praise is so deserved we feel a delicacy in bestowing it, being fully aware that it is generally valued by the object in an inverse ratio to its desert; we therefore leave Count Streleski’s discoveries to speak for themselves. We have, however, one remark to make on the naming of the country and its features. It will be observed that, with one exception, the names selected by the Count are taken from individuals well known in the colony, and while we admire the good taste evinced in this, we feel flattered at the preferences as coming from a foreigner. The single exception to which we have alluded is in the name of „Koscuisko”; and we trust that there is not one man in Australia who will not deeply sympathize in the feelings of the expatriated noble, when his eye rested on the snow-capped summit which recalled to his mind the grave of his country’s hero. The naming of Mount Koscuisko will long remind us of a mingled love of freedom and patriotism cherished in a foreign land, and we trust that its crest may long look down on a people actuated by both.